I grew up a connoisseur of Salisbury Steak. It frequently showed up on the school lunch menu and on the dinner plate. What the lunch ladies served up definitely had a mystery meat quality. And the Salisbury Steak I ate at home came from none other than Swanson. So who knows what was really in it. Probably lots of things that I can’t even pronounce. When I saw a recipe for Salisbury Steak in Cuisine For Two, I decided to see what I could do with it. I figured that even if I totally bombed, it would still be at least as good as any Salisbury Steak I ever knew.Fortunately, this Salisbury Steak is like nothing I ever knew. The sauce, inspired by French Onion Soup, isn’t your typical lifeless boring brown gravy. It’s got some depth. I meant to rework the leftover sauce into a faux French Onion Soup but that plan never saw the light of day. 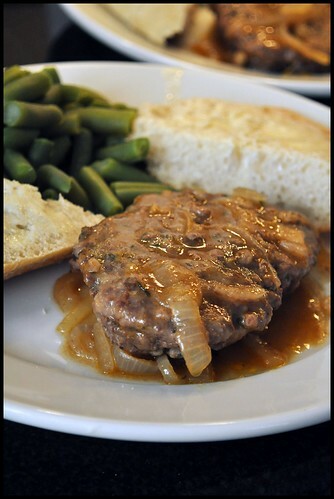 I also meant to serve the Salisbury Steak with some homemade rolls. But you know me and yeast. Maybe next time. Or maybe I can whip up a batch of Ree’s Semi-homemade Buttered Rolls. Now that’s the ticket. Hot rolls topped with melted butter and fresh rosemary would taste much better than the freezer burnt ciabatta from Trader Joe’s that I dug out of the Frigidaire and put on the plate. BAH Note: I’ve scaled the recipe to make four servings which gave us leftovers. And honestly, I think the sauce was a little better after a day or two. Combine ground beef, parsley, salt, and pepper in a medium bowl. Divide the mixture into four portions and shape into patties. Place 4 teaspoons of flour in a shallow dish and carefully dredge the patties in flour. Heat the olive oil over medium high heat in a large frying pan. Add the patties and cook until browned, about 3 minutes per side. Remove the patties from the pan and cover to keep warm. Add the sliced onions to the pan and cook until well browned, but not burnt, over medium heat, 10 to 20 minutes. Add the tomato paste and cook until browned, approximately 2 minutes. Sprinkle the remaining 2 teaspoons of flour over the onion and tomato paste mixture and cook for 1 minute. Add the broth, wine, and thyme and whisk to combine. Add the beef patties back to the pan and bring the sauce to a boil. Cover the pan, reduce the heat to medium low, and simmer for 10 to 15 minutes until the patties are completely cooked. I remember Salisbury steak from childhool. Momma made these hard little lumps of meat that sat still as onion soup gravy washed over them. I KNOW wine was not used. Not sure what she used for meat but somehow the words “hockey pucks” come to mind. and Ithink the gravy came from a packet. Maybe i give it a second try with this one. Emily, you should give this a try. I made a double batch of these, packaged them individually, and froze them for my parents at Easter. I think they said they have one serving left. I had a friend who hated Salisbury steak so much that whenever she came home and smelled it cooking, she’d hurl herself to the ground and start screaming like she was being tortured. I’m sure it made her mother crazy, but I thought it was funny. Kitch, that’s the way I wanted to act when I would walk in the house after school and smell liver and onions. It really was torture. LIVR AND ONIONS?????? I remember it well. Not as well as Labrador herring but well enough to know if there was not tomato gravy to put on my rice I was waiting for dinner tomorrow!. we didn’t even have a dog so I couldn’t feed one under the table BLEAH!